Richard Ljoenes is a Designer and Art Director based in New York City. He primarily works on print-based design, including book covers, illustrated book interiors, advertising, and corporate identity. Here he takes us through his process for designing Alejandro Jodorowsky's Where the Bird Sings Best and The Son of Black Thursday. The first book, which NPR compared to One Hundred Years of Solitude, tells the story of the Jodorowskys’ emigration from Ukraine to Chile amidst the political and cultural upheavals of the 19th and 20th centuries. 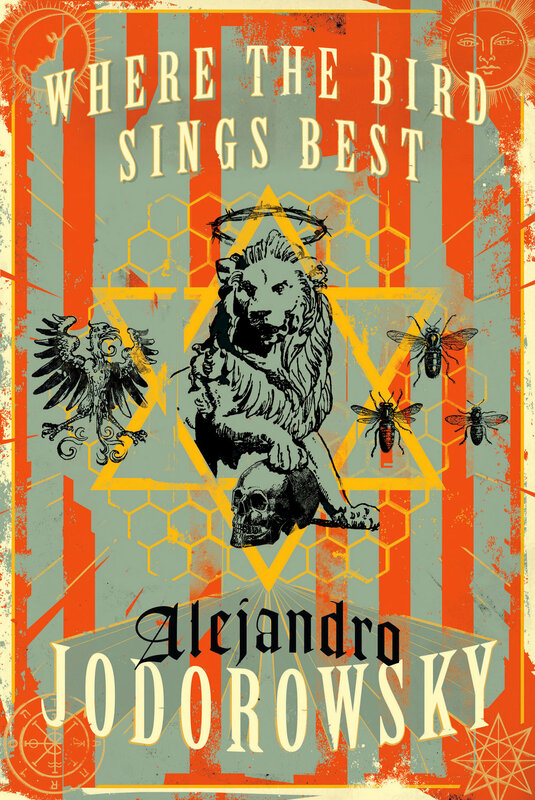 Jodorowsky’s book transforms family history into heroic legend—incestuous beekeepers hide their crime with a living cloak of bees, a czar fakes his own death to live as a hermit amongst the animals, a devout grandfather confides only in the ghost of a wise rabbi, a transgender ballerina with a voracious sexual appetite holds a would-be saint in thrall. Where the Bird Sings Best expands the classic immigration story to mythic proportions. In The Son of Black Thursday, Jodorowsky himself takes the stage alongside the unforgettable cast of his early years as they confront the horrors of indentured servitude in American-backed copper mines and the brutal oppression of a corrupt government. Alongside the young dreamer Alejandro, we follow his father, Jaime, who’s obsessed with assassinating the dictator whom he ends up serving; his mother, Sara Felicidad, a spiritually attuned giantess who moonlights as a shopkeeper-turned-revolutionary and sings instead of speaks; Rubi, the mystic heiress to the copper mines who conceives a magnificent sacrifice to foment a workers’ revolt; and the ghost of a wise rabbi who’s been passed down as mentor from one Jodorowsky generation to the next. I wasn’t familiar with Jodorowsky when the first project came my way. After I started reading the manuscript and familiarized myself with some of his other works, I realized this was something quite special that had landed on my desk. Both books are wild rides and visual spectacles with endless design potential. It was somewhat challenging to figure out the right visual tone of voice on this. While the mood overall isn't necessarily all that dark, the books do feature plenty grotesque scenes among other potent visuals. Finding the right balance was tricky. In the first book lions, lion tamers, bees, Jewish mysticism, and Tarot, are key elements that appear throughout. I tried to combine these in a design slightly reminiscent of old-timey circus posters—themes that occur in both books. For the follow-up book, after determining with the publisher that it made sense to stick with a continuation of the look, things came into place quicker. There is a strong revolutionary theme throughout The Son of Black Thursday, so the idea of a raised fist made sense. This also ties in with scenes towards the end of the book, where Alejandro’s father, now a cripple, paints his hands in the Chilean flag to assist his panhandling. I planned to commission an original illustration for the fist, but in my search for a placeholder piece for my initial comps I stumbled upon this B&W crosshatch by Igor Lukyanov, which after some slight adjustments and colorization ended up being a perfect fit. The backdrop was done in a similar fashion to the first book, while the type was styled a bit more angular to hint at Communist themes that are prevalent in the last book. The four visuals in the corners pick up from the similar Tarot icons used on the the first book (Tarot not only being themes in the book, but a huge part of Alejandro Jodorowsky’s life and persona). The ones featured on the second book all pick up from themes/scenes in the book—not all directly Tarot visuals (but not entirely unrelated either). Overall everything was given a slight distress to add to the vintage look and feel. Both books were printed on uncoated stock. The first title also featured a sculpture-deboss. To see more of Richard’s work, visit www.richardljoenes.com or find him on Instagram at @richardljoenes.